Free Compact Fluorescent Light recycling locations are listed below. Note: Regular, incandescent light bulbs are NOT accepted for recycling. Fluorescent light bulbs contain mercury, which is a hazard for your health and the environment. Never throw them away. Store them outside in a sealed container, and dispose of them as Household Hazardous Waste. 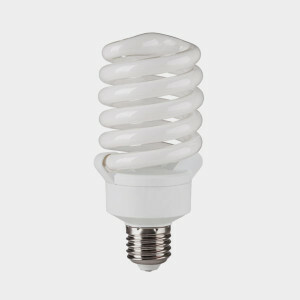 Broken CFL bulbs can release mercury vapor. If one breaks, clear people and pets out of the room, and then air it out for five to ten minutes. To stop the vapor from spreading, also shut off the heat, ventilation and air-conditioning. Don’t use a vacuum to clean up because this can spread the mercury powder from a broken CFL bulb. Instead, sweep up broken pieces with cardboard or paper. If there are any leftover shards of glass, use a piece of tape to pick them up. If you are unsure if your bulb is CFL, check if your bulb is listed with these other CFL bulbs: linear, U-tube and circline fluorescent tubes, bug zappers, tanning bulbs, black lights, germicidal bulbs, high output bulbs and cold-cathode fluorescent bulbs. Lowe’s accepts rechargeable batteries and CFLs at any of their store locations for free recycling. Find the nearest store. Which Bulbs Are More Energy Efficient Than Incandescent Lamps? LED lights are more energy efficient than incandescent and CFL bulbs: they last 50 times as long as traditional incandescent bulb and use 80 percent less energy. Fluorescent bulbs last three to 25 times longer than incandescents and use anywhere between 20 and 80 percent less energy.